I am new to composting this year. I have been placing a variety of browns and greens in my bin, including kitchen scraps. Occasionally, I shake some bokashi over the stew. A few days ago, my husband dumped a couple of shovelfuls of diseased apples (apple scab) in the bin, not knowing that's a no-no. Should I dive in the bin and try to remove the fruit? Can I add something else to prevent the compost from spreading disease when it is finished? Please help.. Thanks! Thanks for your question Leslie. The good news is compost is a decent answer to the problem of what to do with scabby apples and what to do with other diseased plant materials as well. 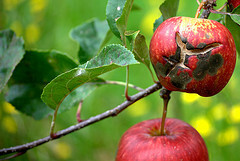 Apple scab is a fungus that over winters in the leaf litter and fallen apples under trees. To actually infect your apple tree in any given year the spores have to splash up to the tree during a time when it is wet. The likeliness and severity of the infection is a function of the number of hours of continual wetness (rain) and temperature. Some years will be bad for scab, others not so much. For your area in Illinois for example it could infect a tree if it was continually raining for 9-14 hours at 50-60 degrees F. The longer it rains the more severe the possible infection. The first line of defense in the battle against scab is choosing apple varieties that are resistant to scab. Even then you can still end up with scab in a wet, humid season. The second line of defense is to eliminate the leaf litter and fallen apples from under the apple trees. For people with just one or two trees it is feasible to rake up the leaves and apples and... You're going to be happy ... Compost them. will help. As well adding a top dressing of a high nitrogen source in the fall will help those leaves break down faster where they sit. You might be afraid that somehow composting all this material you'll risk having a whole compost pile infected with scab. However, that's not the case. The fungi and bacteria that cause diseases such as scab find themselves in a fight they can't win when they are moved to the compost. In the leaf litter under the apple tree the apple scab fungi are the big shots. In the compost pile they're met by thousands of species of bacteria, fungi and other critters and they will be fighting for food and becoming lunch for some microbe, protist or nematode by the time spring arrives. You might want to check out my page on composting leaves as they can be tricky in the compost heap. Make sure to include enough high "green" bits to balance out the leaves which would be considered "browns". Try for a ratio of about two parts leaves to one part a higher nitrogen source. Your apples count as a compost green. If you are short on greens or the compost really doesn't seem to be heating up at all you may want to add a very high nitrogen source. Human urine is ideal if it doesn't gross you out too much. Other materials that can help heat your pile up adequately are cottonseed meal, soymeal, cheap dog kibble, alfalfa meal etc. Build the compost now, in the fall, and let it simmer through the winter until spring. When the weather warms and the pile once again heats up you can do a bit of compost management and get things heating up again. Add nitrogen rich material and turn the pile several times to keep things cooking then let it sit for a few weeks before using. If management is not your thing - you hate to work that hard, just let your pile sit for the season. The leaves need to decompose and sometimes that can take a year or more - but in the overall scheme of life what's the rush? Good Luck and Welcome to Composting.